Below is the audio from the debate. The first clip is from Jon Wolfsthal, Senior Director for Arms Control and Non-Proliferation at the National Security Council. The second clip is Matthew RJ Brodsky's remarks. The last clip is the question and answer session and debate that followed. 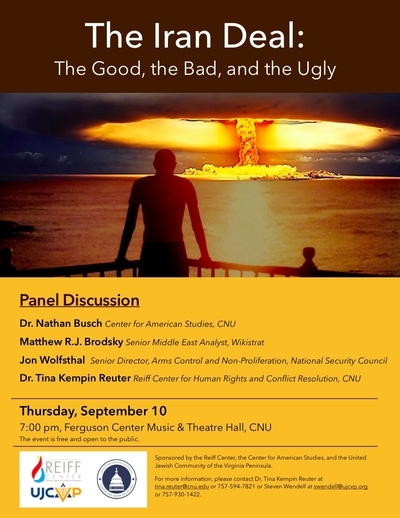 On September 10, 2015, the United Jewish Community of the Virginia Peninsula, Reiff Center for Human Rights and Conflict Resolution, and the Center for American Studies hosted a panel discussion and debate, "The Iran Deal: The Good, the Bad, and the Ugly," at the Ferguson Center Music & Theatre Hall at Christopher Newport University. Dr. Nathan Busch set the scene by describing the various elements of the deal, giving an overview of Iran's nuclear program and pathways to its weaponization, and what the deal means for arms control. With the parameters set, Jon Wolfsthal, Senior Director for Arms Control and Non-Proliferation at the National Security Council presented the Obama administration's case for why the Joint Comprehensive Plan of Action (JCPOA) is a good deal that merits America's support. Matthew RJ Brodsky followed and presented the case against the deal. Dr. Tina Kempin Reuter moderated the lively debate and the question and answer session that followed. Does the agreement prevent Iran from becoming a nuclear power? Are the concessions granted to Iran worth the price of the agreement? Is the deal in the long-term security interest of the United States? He explained that the more the American public hears about the details of the deal, the less they like it, and that bears out in the recent Pew Research poll from Sept 3-7 that shows only 21% of the public approves the deal and only 27% of democrats support it. "That is because what began as a negotiation to lift sanctions in exchange for Iran ending its nuclear program morphed into trading sanctions relief and a host of other rewards for a temporary reprieve of their nuclear enrichment." We had a stronger negotiating position but the White House relinquished and ultimately collapsed on most of their key negotiating positions. "Obama drove into the dealership with a Lexus and left with a Yugo," according to Brodsky. Whether or not one favors the nuclear enrichment and centrifuge restrictions during the 10-15 year term of the agreement is irrelevant given that the when the sunset clause kicks in, Iran will be left with an unrestricted, internationally legitimized, industrial-sized nuclear program with a zero breakout time as Obama recently conceded in a PBS interview. Moreover, the lifting of restrictions is based on an arbitrary timetable, not the regime in Tehran's behavior. After a stream of administration concessions to Iran, accompanied by extension after extension of the negotiations, the White House assured the public that the system for verifying Iran's compliance with a deal would be top-notch. Instead, non-declared sites the U.S. is interested in will be subject to a 24-day delay before inspections. Given the IAEA-Iran side agreement on the Parchin facility, the precedent is set for Iran to collect their own soil samples. "Unprecedented" does not mean "effective" and this inspections regime is neither. The Iranian regime has stonewalled the IAEA on 11 of 12 issues relating to the possible military dimensions of their nuclear program, which prevents the U.S. from having a baseline for their verifications regime. The only penalty for Iran cheating is a mythical "snap back" of sanctions mechanism that doesn't exist and allows Iran to scrap the deal if they're reimposed. Meanwhile, the international community will grant Iran sanction's relief to the tune of $50-$150 billion in the first year. WIth the vanishing of U.S. leverage in the first year of this agreement, we're supposed to trust that Iran will live up to their commitments for 15 years. According to Brodsky, "To believe this deal is in America's interest, you must believe that Iran won't cheat once it has everything it wants; that down the road in some ten years when they are a threshold nuclear state, they will have given up their revolutionary, expansionist, and terrorist-supporting ways and; that Obama can convince Iran's enemies in the region that they have nothing to fear." Given the criteria for judging whether this agreement is in America's interest, the answer to the three questions asked in the beginning is No and that's why we should reject this dangerous deal.